Designed to follow Windows® software development standards, HEC-ResSim’s interface does not require extensive tutorials to learn to use. Familiar data entry features make model development easy, and localized “mini plots” graph the data entered in most tables so that errors can be seen and corrected quickly. 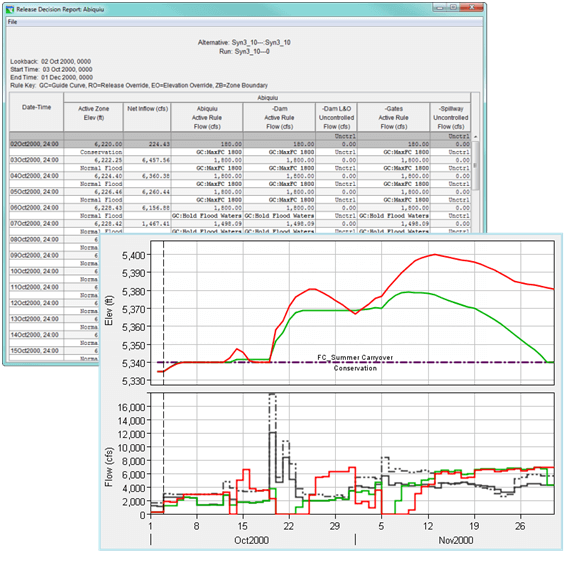 A variety of default plots and reports, along with tools to create customized plots and reports, facilitate output analysis. 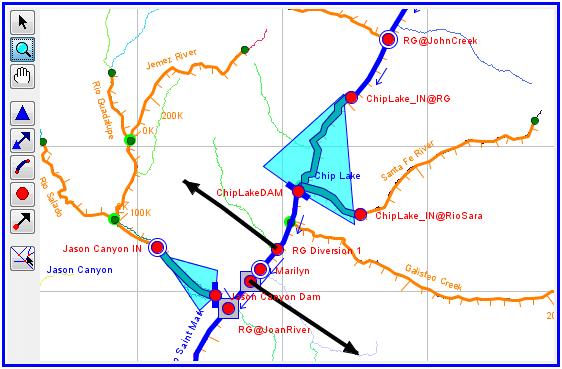 HEC-ResSim provides a realistic view of the physical river/reservoir system using a map-based schematic with a set of element drawing tools. 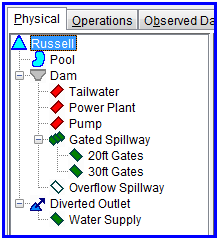 Also, with the hierarchical outlet structure, the modeler can represent each outlet of the reservoir rather the being limited to a single composite outlet definition. 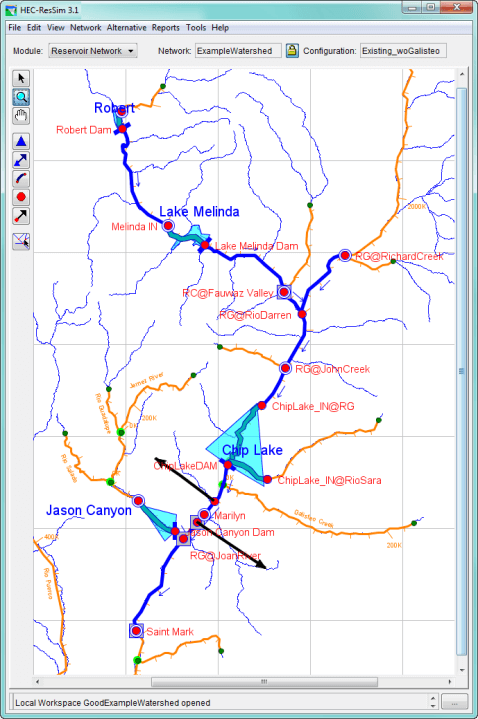 Schematic - The program’s user interface allows the user to draw the network schematic either as a stick figure or an overlay on one or more geo-referenced maps of the watershed. Drawing Tools - HEC-ResSim represents a system of reservoirs as a network composed of four types of physical elements: junctions, routing reaches, diversions, and reservoirs. By combining these elements, the HEC-ResSim modeler is able to build a network capable of representing anything from a single reservoir on a single stream to a highly developed and interconnected system like that of California’s central valley. A reservoir is the most complex element of the reservoir network and is composed of a pool and a dam. 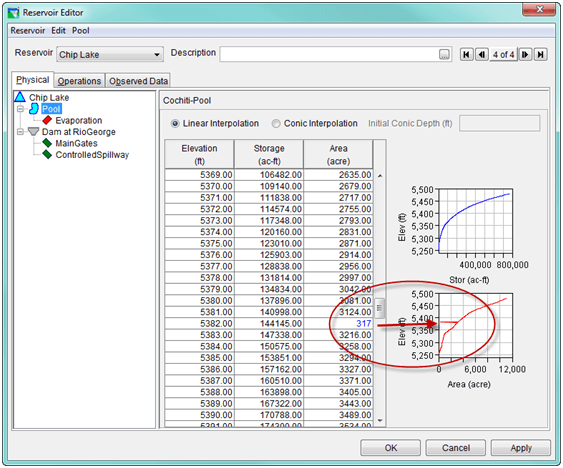 HEC-ResSim assumes that the pool is level (i.e., it has no routing behavior) and its hydraulic behavior is completely defined by an elevation-storage-area table. The real complexity of HEC-ResSim's reservoir network begins with the dam. Hierarchical Outlet Structure - The dam is the root of an outlet hierarchy or "tree" which allows the user to describe the different outlets of the reservoir in as much detail as is deemed necessary. There are two basic and two advanced outlet types. The basic outlet types are controlled and uncontrolled. An uncontrolled outlet can be used to represent an outlet of the reservoir, such as an overflow spillway, that has no control structure to regulate flow. Controlled outlets can be used to represent any outlet capable of regulating flow, such as a gate or valve. The advanced outlet types are power plant and pump, both of which are controlled outlets with additional features to represent their special purposes. The power plant has the ability to compute energy production. The pump is even more specialized because its flow direction is opposite that of the other outlet types, and it can draw water up into the reservoir from the pool of another reservoir. The pump outlet type was added to enable the user to model pump-back operation in hydropower systems, although hydropower is not required for its operation. Most reservoirs are constructed for one or more of the following purposes: flood control, power generation, navigation, water supply, recreation, and environmental quality. These purposes typically define the goals and constraints that describe the reservoir’s release objectives. Other factors that may influence these objectives include: time of year, hydrologic conditions, water temperature, current pool elevation (or zone), and simultaneous operations by other reservoirs in a system. 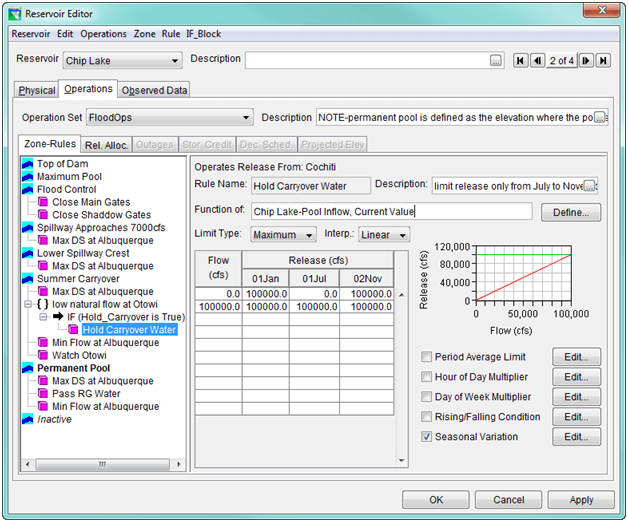 HEC-ResSim is unique among reservoir simulation models because it attempts to reproduce the decision making process that human reservoir operators must use to set releases. It uses an original rule-based description of the operational goals and constraints that reservoir operators must consider when making release decisions. As HEC-ResSim has developed advanced features such as outlet prioritization, scripted state variables, and conditional logic have made it possible to model more complex systems and operational requirements.